Making sure that your office space is clean is very important, for a number of reasons. To begin with, your office space will define your business and is the first thing that will make an impact on visitors. The state of your office could mean the difference between potential clients and lost contracts. Secondly, your office environment affects the mood and productivity of everyone in the office so you must do what you can to make it a happy one. And finally, keeping the office clean is important for health and safety reasons. You cannot afford to take a risk with the well being of your employees, both for legal and moral reasons. As a result, it is evident that office cleaning is an important responsibility and one that you must plan for. Even though most business owners understand the value of proper office cleaning, most are not very keen on the idea of hiring cleaning companies. Doing so is an additional expense and it is understandable- especially if you are a new business owner- that you do not want to incur any more expenses where your business is concerned. 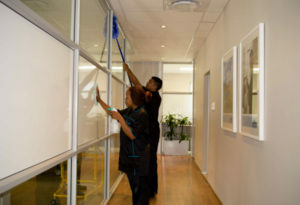 However, for the reasons mentioned above it is very important that your office space be clean and well-maintained, and one of the best ways of making sure of it is to hire a cleaning agency to look after your office space. If you aren’t convinced yet, take a look at some of the reasons for hiring a cleaning service. Any kind of cleaning task, whether it is commercial cleaning or office cleaning requires skill and efficiency. The professional cleaners are trained to perform cleaning chores quickly, effectively and safely. Have you ever wondered why it takes a cleaning team a fraction of the time it takes you to clean up the same space? It’s because the cleaning contractors have experience and expertise that you don’t. When you with professional office cleaning agencies you can enjoy the benefits of their expertise and experience without having to lift a finger yourself. Another aspect of professional expertise is productivity. Not only do the professional cleaners have the know-how needed for efficient cleaning, they get more done in less time. Completing a task isn’t just about how quickly you complete it or how much you get done or how little energy you expend or how you optimise equipment- it is a combination of all these factors and more. The cleaners you hire will bring unmatched productivity to the project and have your office looking bright and shiny in no time. You have no way of knowing whether your office cleaning endeavours will yield the results you desire, but when you hire professional office cleaning services you can be certain of fantastic results each time, every time. Consistency is what makes working with a professional cleaning company such a great idea: whether you’re hiring them for a quick touch-up before an important client meeting or you’re getting annual carpet cleaning and sofa cleaning done, you can be sure of fabulous results. You may think office cleaning is just like house cleaning and all you need is some cleaning agent and sponges, but you could not be farther from the truth. Office furniture is expensive and upholstery cleaning requires special equipment and tools. Office appliances and equipment are pricey and delicate and can’t just be rubbed down with an old cloth. For carpet cleaning you can’t make do with an old broom or a handheld vacuum cleaner, you need a powerful machine. Hiring cleaning services is important because the professional cleaners will have all the necessary tools and equipment needed for the job.